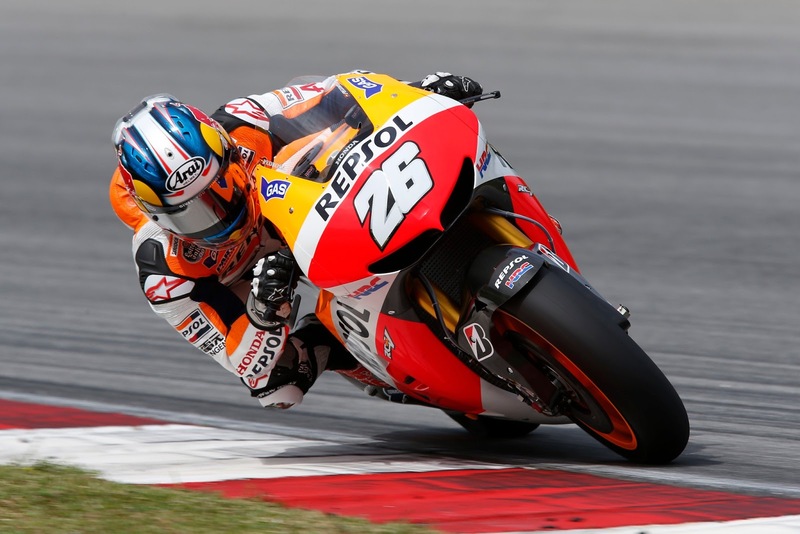 Dani Pedrosa has once more topped the first session of day two at Sepang testing with only a 0.019 second advantage over Jorge Lorenzo. This time the two had pulled a marginally larger gap over current Moto2 world champion Marquez who was a further 0.254sec back. Valentino Rossi finished the session comfortably in fourth position, the same as yesterday, only 0.489 behind. Brit Cal Crutchlow improved on yesterday’s position by going 0.762sec slower than the Spaniard and swapping places with Stefan Bradl who was the last rider under a second from Pedrosa. Bradley Smith improved hugely in the second session cutting the gap down to 1.382secs followed by Alvaro Bautista. It’s still not looking great for Ducati as they were 9th and 10threspectively with Hayden 1.561secs behind and new Ducati recruit Andrea Dovizioso 1.830sec back. Espargaró was fastest of the CRTs and 2.7 seconds off, not far behind new Pramac rider Andrea Iannone. Teammate De Puniet was behind him again by around half a second. Despite reports of Spies’ not riding due to injury he put in a time 2.453 seconds behind Pedrosa and was ahead of his teammate Iannone. Petrucci was third in the CRT category making use of his previous days of testing followed by injured Hiroshi Aoyama and former Pramac rider Hector Barbera. PBM’s Michael Laverty improved greatly on yesterday also moving up to 23rdahead of seasoned CRT rider and teammate Yonny Hernandez. Rain has hit session two. Previous Previous post: Wilks progresses to BSB Stock 1000 with Bournemouth Kawasaki for 2013.